Valentines Day 2012 I have weightloss surgery to help save my life and buy me time to change my health, while I continue therapy to understand why I use food in ways it was never intended. I take on the full time job of what I describe as “dealing with my crap.” I work hard, become an athlete, accomplish physical feats I never dreamed I was capable of. All the while secretly hoping one day to try and get pregnant again before I got any older. I would begin to learn I could stop running from the hard stuff and take it on, and battle through it. I was fine, until things were not in my control. I was fine as long as eating a certain way and working out a certain amount meant weightloss. I was fine until I just couldn’t lose any more weight and it wasn’t making any sense, so my lowest weight never dipped below 208 pounds. My heaviest was 311. I began to learn about how my autoimmune issues played a much bigger role in weightloss but time was ticking. So, I put my weightloss journey on hold and dove into the world of infertility again. We would try to get pregnant, pour in all the hormones, I would gain weight (about 15 pounds), it wouldn’t work, I would spend a few months trying to lose the weight but a few pounds would stay on each time before we would try again, each time with more hormones. Then we moved on to the mac-daddy of all infertility treatments, IVF. It was our last try. I was up to 228 pounds, a size 12, the day we began the IVF ride. After inserting the approximately $10,000 worth of injectable fertility meds, the day of our embryo transfer, I was tipping the scale at 243 pounds. Amazingly, we got pregnant with our precious baby girl, and I worked hard to eat well, exercise regularly, and only gained 11 pounds during my pregnancy. So, the day I gave birth I weighed 254 pounds. I had no idea at that time that the pain in my hip would not be normal postpartum pain, or that it would grow worse, or why. After giving birth, I started exercising as soon as I could, determined to lose the weight as quickly as I could and restart my weight-loss journey again. Between the exercise and all the breastfeeding, I lost all the weight I had gained from the pregnancy and some of the IVF hormones in just a few short weeks. However, the pain in my hip kept growing more intense with no relief. So, when our daughter was 3 months old I decided it was time to figure out the problem because it was clear to me by now it wasn’t going away. I started at the chiropractor who quickly determined something was wrong. I did acupuncture. I then went to physical therapy (PT), which gave no improvement after 6 weeks. Then I went to see an orthopedic surgeon who quickly determined after doing an x-ray that I had a glut med tear and simply needed more PT. After an additional 6 weeks, still no improvement, it was getting worse. At this point, after a horrible battle to try and prove I was indeed in pain, which had been growing worse for over 6 months at this point, I started on pain meds. I took 1-2 just at night so I could have a break and actually sleep. The constant pain made me fell like I was loosing my mind. I went back to the same orthopedic surgeon, who decided that now, I didn’t have a glut med tear, but instead it was bursitis, and a simple injection would fix me up in a jiffy. That simple injection put me at risk for a serious stomach ulcer because I had had stomach surgery, but I did it anyway. It did nothing to help. The pain just continued to get worse, while the pain meds became less and less effective as they often do. 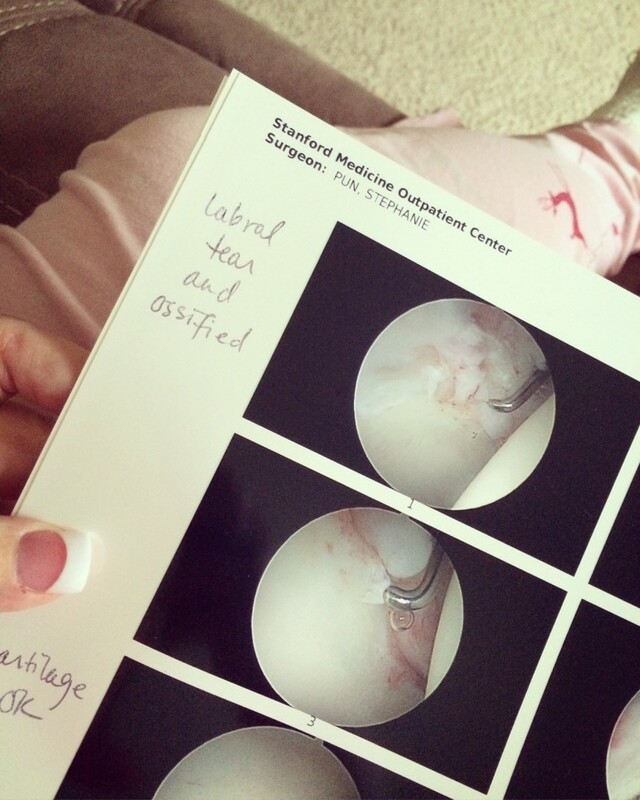 The PT suggested he believed it was a labral tear, which would require surgery. So, I went to a different orthopedic surgeon, who decided to do MRI’s with contrast to see if it was a labral tear. The results were inconclusive, and so with great attitude, he decided I should have another shot, this time in the joint, which would put my stomach in jeopardy again and in no way fix whatever the problem was. I had had enough. I did my research, and found an amazing orthopedic surgeon, Dr. Stephanie Pun, at Stanford who I was hoping would be willing to see me; she was my last idea. Amazingly, I got in. She looked at the MRI’s I had had done, she did her own x-rays, and she ran a test that included injecting numbing meds in my joint to see if it brought relief. It did. The x-ray clearly showed a large bone spur and the injection left her to conclude that surgery would indeed be beneficial. The normally 2-3 hr surgery took about 4.5 hours. 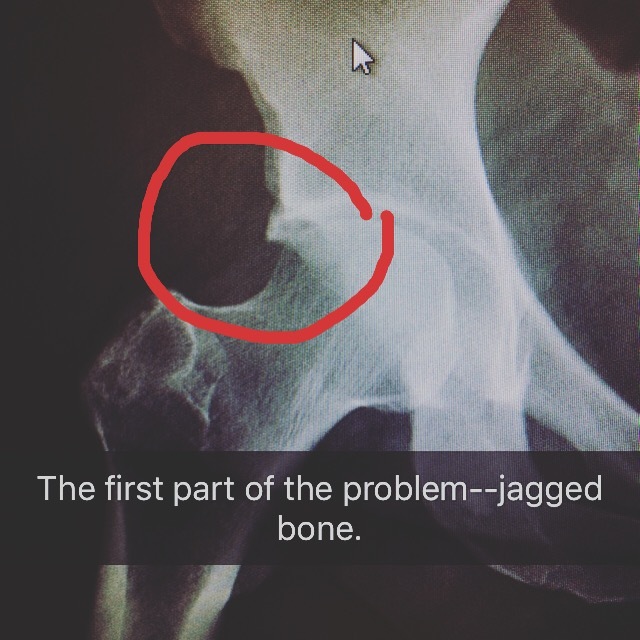 When she went in, she saw that not only did I have a labral tear, but part of it had ossified (turned to bone) because it had been going on for so long. She had to shave 4 mm of jagged bone growth off my ilium, remove 2mm of ossified labrum, reattach the torn labrum and the labrum where my ilium was shaved down and shave 2 mm of bone off of my femur before she was done. 16 months after the pain began. But onto the point of this post…. For over 13 months I have essentially been unable to exercise, due to the pain it caused. It has been maddening. I have been given pain meds and antidepressants to help deal with the pain, both of which cause weight gain. And, I am sad to admit, I have not regulated my eating, to be healthy, because I just couldn’t manage to make it a priority on top of everything else. Today, I got on the scale, and I officially weigh more then I did when I gave birth to my daughter, 262 pounds. And so, with a heavy heart, I start over, again. This time I have to relearn how to walk, and while I have about 3 months of painful PT to look forward to, I won’t be able to go back to the gym until 6 more months have passed. During that time I have to hope and pray that this surgery will have indeed freed me from the pain (because there are no guarantees) and that I will be able to regain normal activities again one day. This unknown, this journey is one of the hardest I have ever been on. I am not good in the unknown. I don’t do well with this level of hard. Chronic pain and being immobile are truly horrid for me. However, I will press in, I will move forward, and I will work hard to do all that I can. So, starting today I am weaning off the crutches I have lived with for the last 2.5 weeks. I am beginning the weaning off of all the medications that I hate being on to begin with. And I am tackling my diet, the one thing I have some control over. It is time to work hard to reduce the inflammation in my poor body, and hopefully start to feel much better. Here is to never giving up, even when you want to, even when you are so weary you can’t see straight, even when you have no idea what the end outcome will be.